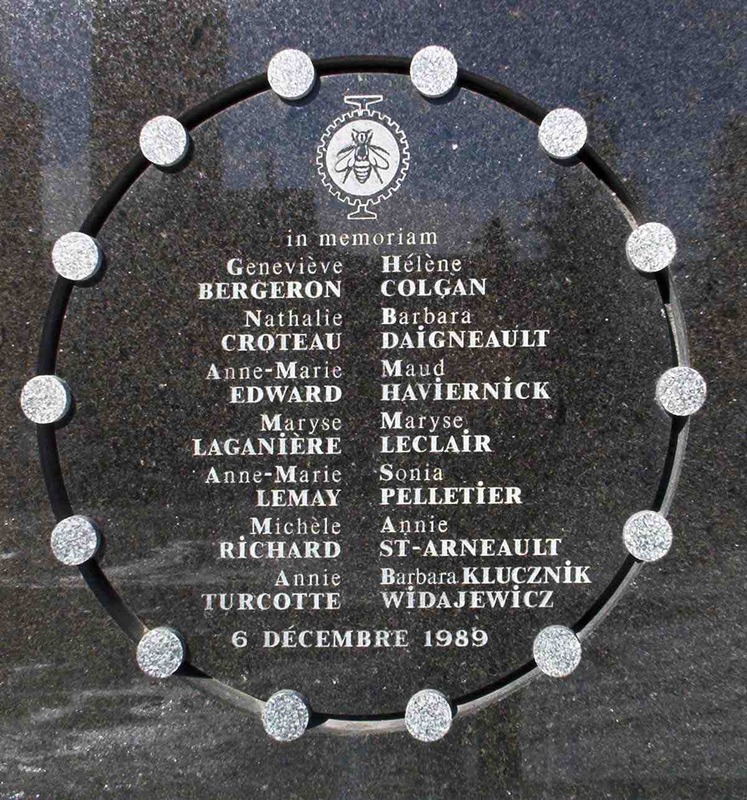 On December 6, 1989, 14 women were killed at École Polytechnique. They were killed because they were women, because they were students in an engineering program. What has come to be called the Montreal Massacre is an event we are all called upon to remember: violence against women continues to be part of our present. The plaque on the exterior wall of École Polytechnique commemorating the victims of the massacre. Photo courtesy of Wikimedia Commons. This is the 21st anniversary of the murders of these women, and 6 December is again to be commemorated as the National Day of Remembrance and Action on Violence Against Women. It is an occasion to remember the women murdered and for all of us to recommit to ensuring their deaths were not in vain. As we mourn the 14 deaths in 1989, however, we must also be mindful of – and mourn – the too many women and girls murdered or abused since then. We need to continue to work for women’s equality, for policies that lead to equity among women, and to an end to structural and individual violence against women and girls. Canada is still not a safe country for all the women who live here, with more than 50 per cent likely to experience violence sometime in their lives, usually before they are 25. For some women, those most marginalized, these risks are even greater. Societal and structural policies and programs continue especially to harm single mothers, women with disabilities, and indigenous and immigrant women. These, as well as increasing limits on women’s access to justice and to continuing inequities, may explain why Canada was in only 25th place in the 2009 Global Gender Gap Report of the World Economic Forum. So, while we remember the women who have died on 6 December, we must also re-commit to taking action throughout the year: Canada is not yet a safe country for women and we need to continue to act to remove the violence against women that comes from social policies and political decisions, as well as the acts of individuals. Abby Lippman is a professor in the Faculty of Medicine, Department of Epidemiology, Biostatistics and Occupational Health and the Chair of McGill’s Senate Subcommittee on Women.